There are so many diets out there- some based on science, others on religion or ethical beliefs, and more than I can attempt to count based on nothing other than anecdotal experiments or strange food combinations! But what’s the best for physical endurance sports like marathoning and racing triathlon? Having experimented with my own diet (including the ‘healthy balanced American diet’, the Zone diet, the Blood Type Diet, a Vegan diet and finally, what I found to be the best fit for me, my family and many clients worldwide, the Paleo diet) over the years, I wanted to share my own experience with being an endurance athlete who’s followed several different types of eating plans over the years, all the while training for and racing triathlon. Two in particular were the Vegan Diet and The Paleo Diet. (Keep in mind that this piece serves only to describe how the two diets applied to training and performance and is not an attempt to stimulate argument or controversy over the animal rights issues that were the very reason I followed a vegan diet for two years, about a decade ago). I have found with clients that the best approach is to start with a guestimate and then based on a collective trial and error approach, determine how much protein one needs in keeping with the balance of the Paleo diet, which is often erroneously referred to as being high-fat, high-protein and low or no carb. None of those statements are correct. 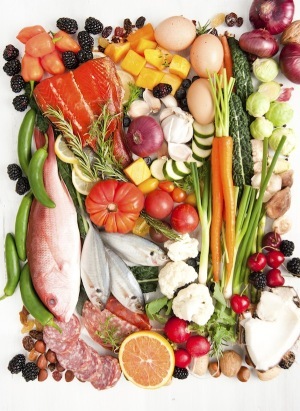 The balance of the Paleo diet is forty percent carbohydrate, mostly coming from fresh vegetables and some fruit and thirty percent each from lean, wild proteins and natural fats. Back when I was vegan, I knew I was lacking something in my diet as, I began dreaming about eating fish! Because of my ethical beliefs at the time, I opted not to have any animal products for months and months, waking each morning feeling guilty, but I grew more and more hungry for animal protein and ultimately added it into my diet. What I found to be the single most important thing in achieving the balance was to be sure I source all my protein from reliable, sustainable, humane sources. I still believe in animal rights; at the same time, I have read countless studies demonstrating why eating meat is the very thing that set us apart from other mammals and allowed our brains to evolve into what they are today. Ultimately, I do not believe that being vegan is the best way to support endurance athlete’s training regime. Furthermore, not only does a vegan diet not provide essential foods to a human being, regardless of whether they are an athlete or not, it puts them at risk for many health issues. One of many examples is the amount of soy and textured vegetable protein that is all too often a part of the vegan diet; when I think back to the amount of this acid-forming, anti-nutrient foods I used to ingest and the damage I caused to my body, I can only wish I knew back then what I know now! However, as eating is such a personal choice, I also feel it’s necessary for people to try different types of eating plans in order to see what fits them best. I have been contacted by many vegan athletes over the years who faced the same dilemma and asked for help keeping the delicate switch from vegan to Paleo while still being concerned about animal welfare. Certainly, there are those who are vegan and perform at a high level, and my position is not to say that they’re ‘wrong’; however, the negative impact that eating grains and legumes has on the body is not conjecture. There are decades of studies showing how significantly damaging these foods are on the body as a whole, causing inflammation and disease, leading to a whole host of illnesses. Without going into too much detail, between that time and the subsequent several years, I learned I was gluten intolerant (ironic, given the fact that I’d been consuming lots of wheat-gluten heavy and texturized veg protein ‘fake’ meat products!) and as such, removed grain from my diet. When I researched a bit and learned about The Paleo Diet, I adopted its principles and removed all other grains, legumes and dairy from my diet as well. I felt incredible, and continue to have amazing amounts of energy, rarely get sick, recover from strenuous training quite quickly and have arrived at a lean bodyweight and a fast racing ability that I never dreamed possible! One mistake I see a lot of my clients make is to omit the non Paleo foods so often marketed to athletes, like bagels, pastas and bars, then not replace them with Paleo friendly alternatives, like yam, sweet potato or kumara. Another important part of the equation is to incorporate some fasted training in order to teach the body to become more efficient at using fat as a substrate. In addition, many people do not recover properly from their training sessions. Right after a long endurance work out, consuming a home-made recovery drink, such as Homebrew (recipe in The Paleo Diet for Athletes by Dr. Loren Cordain, PhD with Joe Friel(Rodale) allows the body to repair, recover and prepare for the next session to come. Based on a simple formula particular to your bodyweight, it’s a combination of easily digestible protein (ideally egg white powder) along with a high glycemic fruit, like banana. Taken right after a long workout, it’s an essential part of a paleo athlete’s training regime, just as crucial as sleeping properly, eating well throughout the day and getting regular bodywork! If you’re questioning whether it really supports endurance training, check out my race history and see for yourself how my Paleo lifestyle over the last seven years not only supported my training and racing, it proved to be one of the main facets of the foundation of how I was able to go from a middle of the pack age grouper to podium finishes! I’ve won multiple 70.3 races; in 2009 I was the fourth woman overall, including the Pros at Hawaii 70.3 and the first amateur across the line. I have raced twelve Ironman triathlons including Ironman World Championships in Kona six times (PR of 10:17, 6th age group) and have a marathon PR of 3:01. This is not to brag; rather, to prove that with dedication, commitment and a well thought out nutrition plan (Paleo), there’s no reason not to set high athletic goals for yourself. Whether you are considering going Paleo or vegan, the most important thing is to make sure you’re fueling enough. Most athletes, with whom I’ve worked, tend to under eat calorically before, during and after training. Granted, there is a time and place to incorporate some fasted training into your regime, as it does help the body to become more efficient at using fat as a substrate, but that is not to say that one should head out for a three hour run on empty! Keep in mind that many of the theories we all hear when we’re new to the sport like the concepts of ‘bonking’ or ‘hitting the wall’ are easily avoided and needn’t be an expected part of your training. Rather, if you fuel and hydrate correctly, you should be soaring ahead from an energy stand point, despite how hard you might be pushing and no matter what diet you’re on. The best way to find out whether a diet is right for you? Simply to give it a try. I’ve found the Paleo diet to be the best fit for me, my husband and several of my clients and virtually everyone I’ve known who has given it a fair try at least for a period of a couple of months. If you don’t give it a try at 100%, you’re not fairly giving it a chance. Even a little bit of gluten, or soy, or milk, is enough to keep the body’s inflammatory reactions going on. You can ease into it if you prefer, but aim for at least a month or two of clean fuel before you judge it. Ultimately, one has to be open minded to begin to follow The Paleo Diet, whether coming from a Vegan background, or the traditional athlete’s diet, high in processed, grain-based carbohydrate. It does seem difficult to follow at first, and there is a period which many (including myself) go through, of feeling low energy and thus questioning whether it’s the right diet for you or not. Fortunately, this typically lasts only a week or two, and granted, they are a tough couple of weeks, but if you see it through, you’ll find yourself fitter, faster and leaner than you could ever imagine!